The lesser known of two professional baseball-playing brothers, Mutz Ens had a nightmarish tryout with the 1912 Chicago White Sox. In three early September games, he went hitless at the plate, made a rash of physical and mental miscues at first base, and was relieved of his uniform little more than a week after making his major league debut. Relegated to midlevel minor leagues, Ens posted pedestrian numbers over the next four seasons, thus confirming the White Sox’ assessment of his talents. Simply put, Mutz lacked big-league playing abilities. Upon leaving the game, he spent the remainder of his life living and working quietly in his native St. Louis, his passing in 1950 little noticed on the sports pages. Still, Mutz Ens earned a distinction that few men can claim: a stat line in the major-league-baseball record book. Born Anton Ens on February 2, 1887,1 Mutz was the eighth of nine children born to Anton Ens, Sr. (1846-1910) and his wife, the former Adleheide (Adele) Bartels (1846-1906). The parents were Bavarian Catholic immigrants who settled in St. Louis in 1866. Father Anton supported his growing family2 working first as a millwright, thereafter as a sales representative for local steam-pump manufacturers. Little is known about Mutz’s early life, including the origin and meaning of his nickname.3 According to various US censuses, he finished four years of high school and began his working life in St. Louis brass foundries. Along the way, Mutz, and his brothers Emil (later a groundskeeper at Sportsman’s Park), Charley (a minor-league pitcher), and Jewel (a 1920s Pittsburgh Pirates player and thereafter a big-league manager, coach, and scout) began playing baseball on the sandlots of St. Louis, a hotbed for the amateur and semipro game. 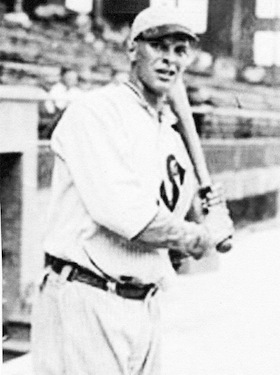 Although he was included in a preseason pictorial of lefty-batting Brewers published in the Milwaukee Journal,13 Ens did not spend much time with the club that season. Before the campaign began, his contract was sold to another city club, the Milwaukee Creams (or Mollies) of the Class C Wisconsin-Illinois League.14 No sooner had Ens switched uniforms than he was recalled to the Brewers to fill in for ailing first baseman Tom Jones. Mutz debuted with a double and triple in a 7-2 loss to the Columbus Senators, but his bat faded quickly thereafter. Batting .200 (6-for-30) in nine games, Ens was sent back to the Creams for their Opening Day contest, but was immediately sidelined by a leg injury. He did not get into the lineup until late May.15 As earlier with the Brewers, Mutz began on a tear, going 10-for-34 in his first 10 games.16 Meanwhile, the Creams franchise was transferred 60 miles north to Fond du Lac, a move celebrated by a game-winning Ens home run in an 8-7 victory over Madison. As the season progressed, Ens’s numbers receded to more characteristic norms. Combining his Western and Wisconsin-Illinois League stats, Mutz batted .264, with 27 extra-base hits, in 100 games. But his 81 strikeouts (compared with only 26 walks) were a problem. Not so, Mutz’s fielding; his .981 fielding average placed him in the lead division of league first sackers.17 The sum total of his work garnered Ens a promotion. Purchasing his release from Mollies owner Charles Moll, Mutz signed with the New London Planters of the Class B Eastern Association.18 But the real highlight of 1913 occurred away from the diamond. That year, wife Belle (nee Johnson, 1888-1978), the St. Louis girl whom Mutz had married in 1910, gave birth to the couple’s only child, a son named William. Prior to the start of the 1914 season, New London sold the Ens contract to a league rival, the Bridgeport Orators.19 Mutz quickly settled in as his new club’s everyday first baseman, and by late May, Midwest newspaper readers were being advised that Ens was “doing well at Bridgeport. His hitting is liked by the fans.”20 He finished the campaign batting .260, with 29 extra-base hits, in 117 games for the third-place (67-56) Orators. He also stole 29 bases, and supplied first-rate defensive play (.989 FA).21 But the situation in Bridgeport, and in the Eastern Association as a whole, was unstable. In March 1915 Ens joined several teammates in a holdout, rejecting Bridgeport contract offers.22 Then the circuit itself failed, leaving players to scramble for berths elsewhere. Ens hooked on briefly with the Erie (Pennsylvania) Yankees of the Class B Canadian League, but the club folded before the season began. He then joined the Lynn (Massachusetts) Pirates of the Class B New England League. His tenure there was short, as well. Upon being released, Mutz signed with another NEL club, the Manchester (New Hampshire) Textiles, where his stay was even briefer. “He played one game with Manchester and drew his walking papers.”23 Ens then went home to St. Louis where he remained until a former employer, St. Joseph of the Western League, signed him.24 Class A competition, however, once again proved too fast for Mutz. In 38 late-season games, he batted a paltry .195, with little power (only eight extra-base hits). Ens spent the 1916 season in more congenial Class D settings, splitting time between the Muskogee (Oklahoma) Mets of the Western Association and the Waterloo (Iowa) Shamrocks of the Central Association. His performance at each venue was near identical. Muskogee: .277 BA in 46 games; Waterloo: .276 in 47 games. Mutz’s final professional engagement was with the Lynchburg Shoemakers of the Class C Virginia League. The circuit folded shortly after the nation’s entry into World War I, and by mid-June 1917, Ens was reporting employment at another St. Louis brass foundry to his local draft board.25 Although he was only 30 years old, the baseball career of Mutz Ens was now over. Inducted into the US Army in July 1918, he served with a St. Louis depot brigade until honorably discharged some six months later. Sources for the biographical information furnished above include material in the Mutz Ens file maintained at the Giamatti Research Center, National Baseball Hall of Fame and Museum, Cooperstown, New York; family tree info posted on Ancestry.com; and various of the newspaper articles cited below, particularly obituaries/death notices published in the St. Louis Post-Dispatch and the Rockford (Illinois) Register-Republic. Unless otherwise noted, baseball stats have been taken from Baseball- Reference. 1 Wikipedia and other general references provide the November 8, 1884, date of birth supplied in a posthumous, error-ridden player questionnaire submitted to the Giamatti Research Center by nephew Charles A. Ens Jr. The February 2, 1887, birth date used herein is the date on Mutz Ens’ Missouri birth record, his sworn World War draft registration form, and his death certificate, and is the one accepted by Baseball-Reference, Retrosheet, and other baseball authorities. 2 In addition to Mutz, Anton and Adele Ens had three daughters: twins Bertha and Sophia (born 1871), and Emma (1883), and five sons: William (1875), Emil (1878), Charles (1882), Otto (sometimes given as Adolph, 1885), and Jewel (1889). 3 Mutz is German slang for a baker, a short person, or a dandy. Given Ens’s 6-foot-1-inch height, it is improbable that he was ever considered short, but the basis of his nickname was undiscovered by the writer. 4 As per Sporting Life, November 10, 1910. 5 According to the transaction cards on file at the Giamatti Research Center. 6 Baseball-Reference has no stolen base data for Ens in 1911. The above info was taken from the 1912 Reach Guide. 7 As per the Baseball-Reference Bullpen Section entry on Mutz Ens. 8 “Sox Sydelights,” Chicago Tribune, September 3, 1912. 9 Chicago Tribune, September 4, 1912. 11 Ens turned out to be the player to be named later who finished a deal made on August 9, 1912. 12 As reported in the Milwaukee Journal and Milwaukee Sentinel, January 17-18, 1913. The writer is indebted to Milwaukee baseball historian Dennis Pajot for insight into the transaction. 13 See the Milwaukee Journal, March 16, 1913. 14 As reported in the Milwaukee Sentinel, March 29, 1913. See also, the Daily (Rockford, Illinois) Register Gazette, April 11, 1913. 15 As per the Daily Register Gazette, May 27, 1913. 16 As per the Rockford (Illinois) Republic, June 28, 1913. 17 The strikeouts, walks, and fielding average are taken from the 1914 Reach Guide. 18 As per the transaction cards in Ens’s file at the Giamatti Research Center. 20 Daily Register Gazette, May 28, 1914. 21 Ens’s stolen bases and fielding percentage are taken from the 1915 Reach Guide. 22 As reported in Sporting Life, March 28, 1915. 23 As per Sporting Life, June 6, 1915. 24 As reported in the Chicago Tribune, August 7, 1915, and Sporting Life, August 14, 1915. 25 As per the World War I draft registration card completed by Ens on June 17, 1917. 26 As per the death notice published in the St. Louis Post-Dispatch, June 30, 1950.